RESUTLS: How often do you have family portraits taken? Last week I had posted a poll asking readers and social media followers how often they have family portraits taken. After I dumped all of the votes into my public opinion projector, I ended up with some results, the winner of which surprised me a bit. I was certain that the majority winner would be those who have family portraits taken once a year as this seems to be somewhat of a stereotype for the “traditional,” American family. Thoughts of family photo day conjures up visions of screaming children, mothers with shattered nerves, and the ever-popular wacky outfits such as is typified in an episode of Raising Hope. My family, for one, has never had official family portraits taken (and by “official” I am not referring to the stuffy Olan Mills variety…just official-y…pictures…with a photographer and not a camera timer), a point which I am growing to regret more as time goes on and the children get older. Sure, we’ve had family snapshots, and I take portraits of my wife and kids, although not as frequently as I should, but it’s still not the same as having all of us laughing and having a good time in the picture together. Which camp do you fall into? What are the reasons for your family photo frequency (or infrequency)? 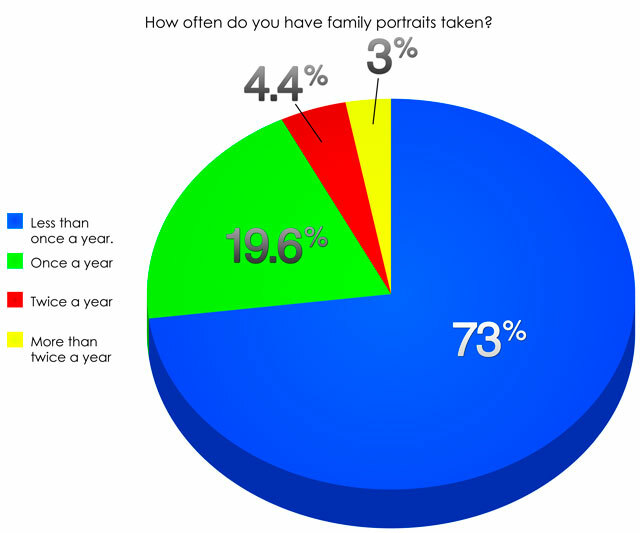 Home » RESULTS: How often do you have family portraits taken?